It is officially summer break! I now have a 1st grader, really? When did that happen? We wouldn’t have made it here if it wasn't for my son’s teacher, Mrs. E! She was awesome!! I don’t know how I could ever thank her enough. I handed over my son to her for 7 hours a day, 5 days a week. Yes, it is her job, it is school, but she really cares for the kids. It really was like every kid in the class was one of her own. So what do you do at the end of the year to thank her for all her caring and hard work? Make her candy! I figure another coffee mug, or Best Teacher nik-nak is the last thing she needs! So what do I do? I do what I do best, take to the kitchen. I made Peanut Butter Cups and then my version of a Milky Way (coming soon). I think the handmade gifts, food or otherwise, really show someone you care. I hope that is what she got out of it as well! These are actually super easy to make! No dipping of chocolate required! The recipe makes about 36 mini cups, and from start to finish (minus the hardening time at the end) it took me less that 30 minutes. Line a mini muffin tray with liners. Put peanut butter, butter, and salt into a microwave safe bowl. Microwave for about 20 seconds, just to get it soft. You don’t want the butter melted. Stir in the sugar until it is well combined. Melt the chocolate and the shortening together over a double broiler. Fill the bottom of each muffin liner with a teaspoon of melted chocolate. Top with about a teaspoon of the peanut butter mixture. Finally, cover each one with more chocolate. Set in the fridge to harden. This makes about 36 peanut butter cups. I did mini, but you could easily use a regular muffin tin, and make larger ones! I am so bad at NOT bookmarking peanut butter recipes. I need a different goal to work toward. Mmmmm. Those look really good. I try to avoid making anyone anything with peanuts now since so many people are allergic... But I'm not, and I'll love these! Those pb cups would definitely not last long in my house. They sound like a perfect summer treat, though....no baking! These look and sound awesome Erin! I would eat way too many of these beauties! Isn't it amazing to see our kids getting older before our eyes? Congrats on having such a wonderful teacher. I hope that for our daughter as she enters kindergarten this fall! WOWEEE!!! Love it! They look beautiful!! I'm in love with this! I made 131 mini carrot cupcakes last week and was staring at the little 1-inch liners I was using. I had actually thought about making peanut butter cups but didn't know how to go about doing it. Well... now you know what I'm going to be doing soon ;-) Thank you so much for sharing this recipe. Congrats to making it to summer vacation :-) Hear hear to being done with school!!!!!! I am a total sucker for PB cups! These are awesome! I love peanut butter cups! I made some myself out of leftover melted chocolate a few months ago and I couldn't stop eating them. I'm sure Mrs. E appreciated these more than another mug. Congrats on having a first grader! These cups look lovely! I love peanut butter in them! Great photos, no wonder why they are considering your photos on tastespotting and Foodgawker!!! Congrats, Erin. A perfect gift. These look wonderful and so delicious. Yes I am with you with kids growing up! Mine are in school from 8 to 3 and I have to hand it to those teachers, especially with Kindergarten age! 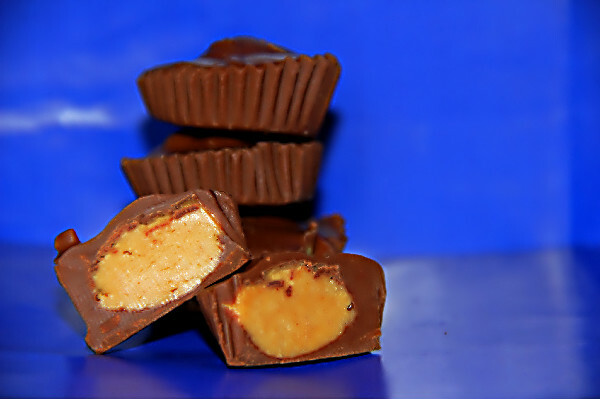 Your PB cups look amazing girl, I hope it is up on top 9, because it looks and sounds fantastic and very delicious!!! Oh, yum. This is the perfect teacher gift. I've been wanting to make these; thanks for the recipe. It will be a great summer treat to make. Yup, super hungry now :)! So cute! What a great gift for a teacher, I bet she loved them! These would disappear quickly in our house...and I know I'd eat my share. Delectable, Erin!!! My husband loves peanut butter cups (we no longer can buy them here in Australia) so thanks for the recipe! Will have to try them out soon. Great blog by the way - now following! Will have to try this recipe..My grandchildren LOVE peanut butter anything! Baked Wontons and a Bonus!